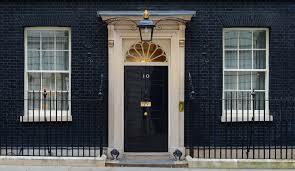 From an Anglo-centric point of view the most famous door in our island realm has got to be the black and shiny one that fronts the Prime Minister’s official London residence at 10 Downing Street. When it comes to watching the political comings and goings – during important events in our nation’s history – you may have noticed (as such things are photographed and televised) that it is a lion’s head door knocker that is grasped and used by whoever is announcing their presence and wanting to gain entry. A lion’s head has got to be a popular subject for such a piece of door furniture . I have spotted many here on the imposing streets of Georgian Bath. A Bath lion door knocker! Black iron or shiny brass – they stare out both fiercely and proudly from their lofty perch above each individual threshold. Door knockers appear in every culture but l was interested to learn that in Ancient Greece slaves were often assigned to answer doors and were chained to the portal in order to prevent them from running away. It appears that the lion’s head design also existed for door knockers in ancient Greece. 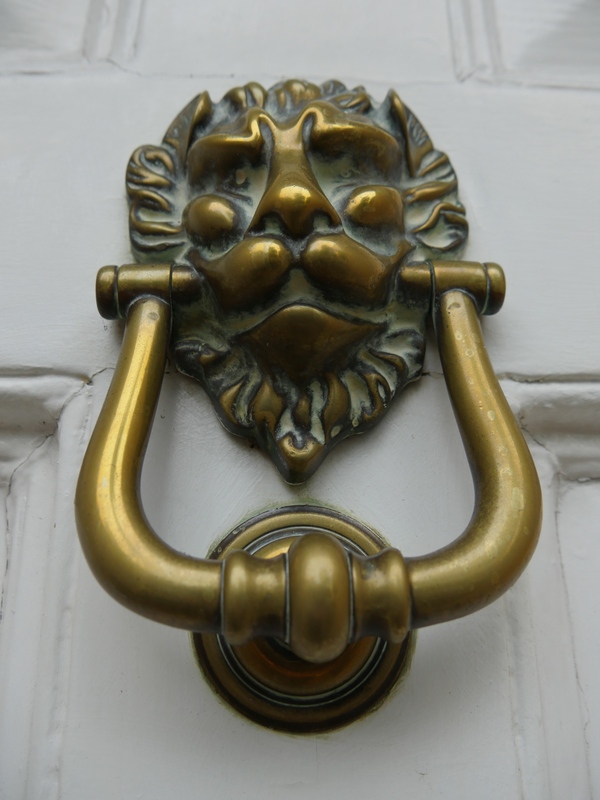 So, what’s the significance of lion’s head door knockers? Did they symbolize anything, or were they just decorative? Well it seems lions held symbolism in lots of ancient cultures, and often embodied power and strength. 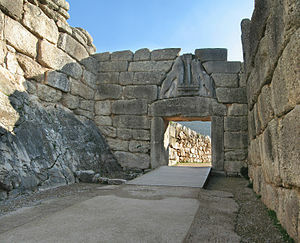 It’s likely that lion’s head door knockers were intended to serve the same symbolic function as the lion statues which decorated the gates of the Mycenaean citadel (Lion Gate at Mycenae, c. 1250 BCE). These intimidating stone creatures serve as guardian beasts for the city, as well as symbolizing strength and power. In terms of the more recent British Empire they remain as guardians – and symbols of our now faded imperial power – around such things as Nelson’s Column in Trafalgar Square and in front of the Fitzwilliam Museum in Cambridge. 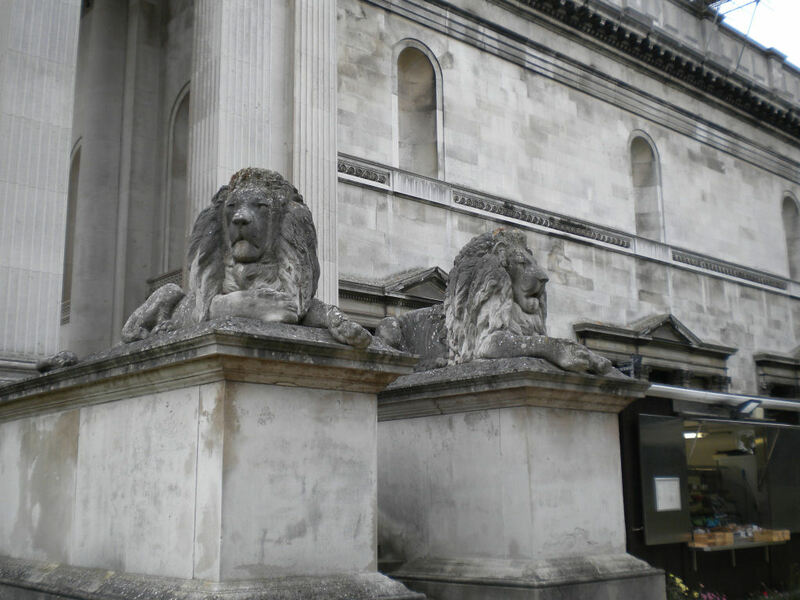 The lions outside the Fitzwilliam Museum in Cambridge. 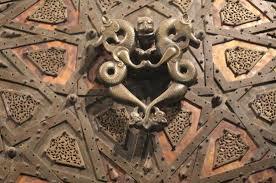 I think it is fair to see the same purpose being fulfilled by lion’s head door knockers, which rest on the doors (i.e. gates) as guardians of the hearth. In the Middle Ages they took on gruesome faces such as gargoyles and dogs – as well as lions. Images it was thought would ward off evil spirits from the home. Dragon door knockers at Cizre Great Mosque. East – as well as West – used the same device. The doors of the Cizre-Great Mosque in Anatolia in Turkey – which was built in 1160 – hold two dragon door knockers. There are lions and dragons in China and just look at the lion-bodied Sphinx guarding the Great Pyramids of Giza. The ‘Ring of Mercy’ on the Cathedral St Maria in Augsburg, Germany. There was apparently no need for guardian figures at the door to a church. It was thought the holy water in the baptismal font just inside was enough to ward off evil. However some church doors had something called the ‘sanctuary knocker’ – a large ornamental hoop found on the door of a cathedral. A Bath-based descendant of the ‘sanctuary’ knocker? Under medieval English common law these instruments supposedly afforded the right of asylum to anybody who touched them. By 1623 the laws permitting church sanctuary had been overturned by parliament. 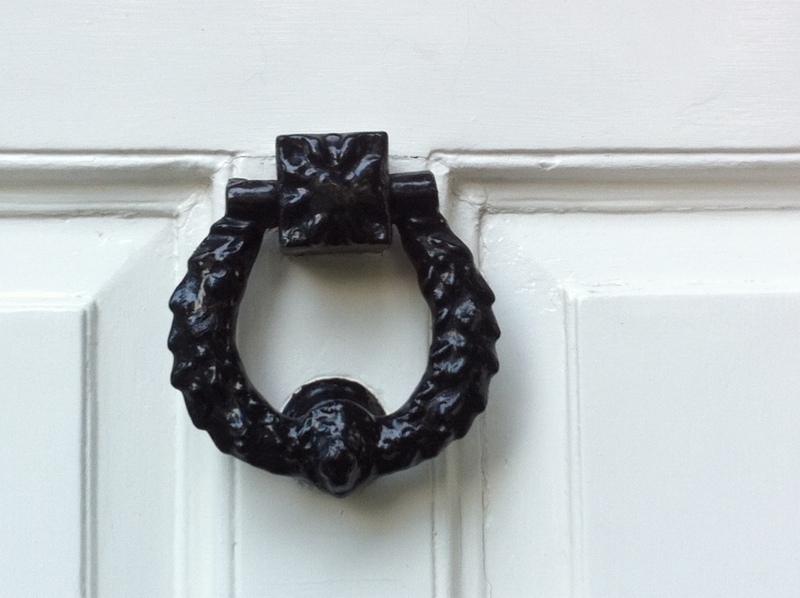 However, the ‘church knocker’ is another popular contemporary choice – as is a hand-shaped device. This is something often seen in Muslim countries and was thought to symbolise the hand of Fatima – daughter of the Prophet – which protected the house from evil and was also a way to show that the occupants of that house were followers of the Muslim faith. It was also assumed that there were different hand knockers – one male and one female – as it was considered inappropriate for the woman of the home to open the door to a man. Therefore visitors would use the knockers according to their gender. Each knocker would make a different sound so the woman of the house would know whether or not she should open the door. A touch of Art Nouveau. 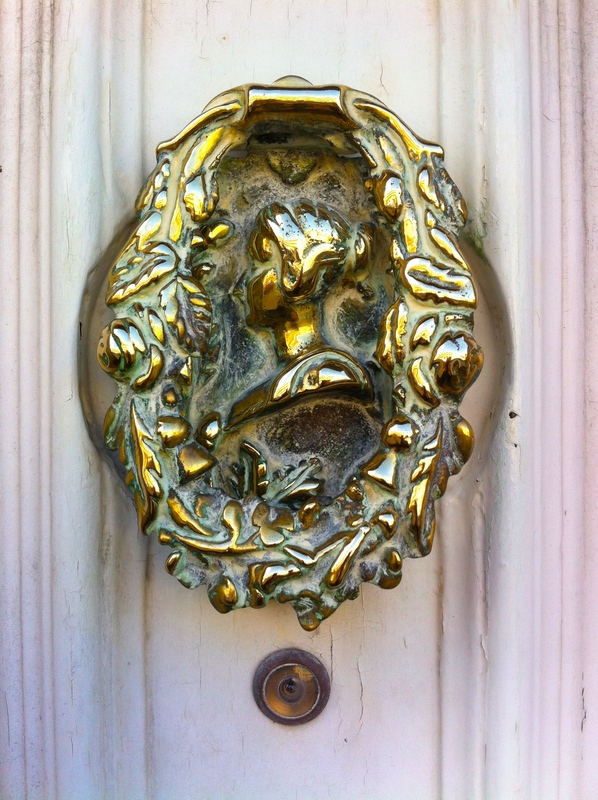 A Victorian love of ornamentation and expression brought forth a plethora of different shapes and subjects for knockers. The head of a goddess is another popular choice in Bath. Some to bring a smile to the face of the visitor waiting outside and others reckoned to bring good luck inside – every time the door was opened – such as horseshoes, stars, suns and flowers. Overall a grand setting and a solid door calls for a grand gesture – despite the fact the electric doorbell has been around for quite a while now. The bell might do the job of announcing your presence but there is no real connection – via metal hitting metal – between the visitor and the householder. No link with the portals of the past. Is this Jane Austen herself greeting visitors to this Bath house? Doorways from public to private. Brass and iron guardians of gateways linking people and different worlds. 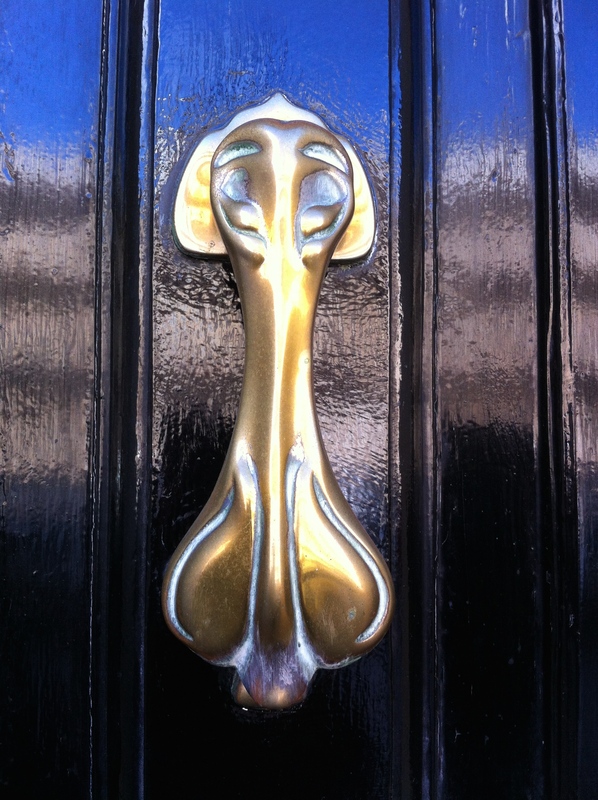 Do look out for unusual door knockers and let the Virtual Museum know what you have found. This Museum is also grateful to anyone who wants to add to this brief look at the history of the humble door knocker. Comment: I have been collecting information about Door Knockers since last few days. 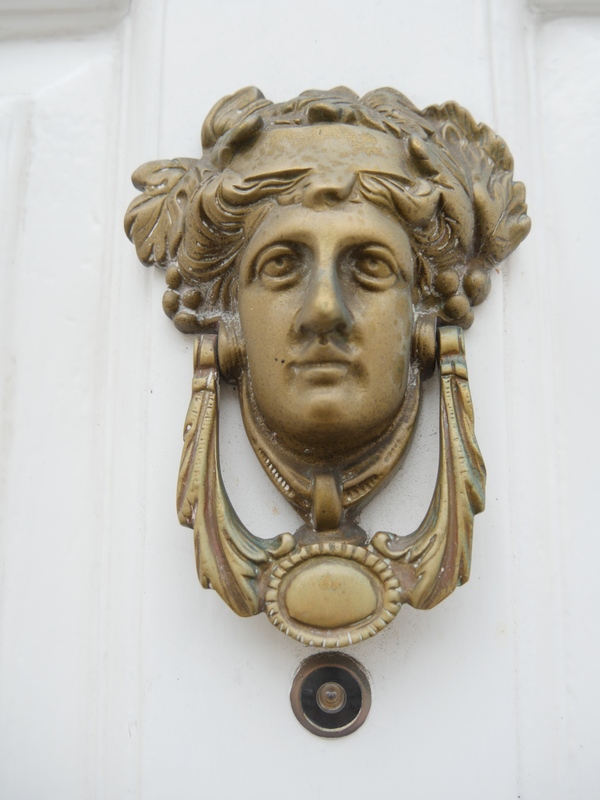 So I came across your blog post related to Door Knockers (https://bathnewseum.com/2014/10/30/knock-knock/). I found the information that you shared about the Door Knockers so detailed and informative. I have also wrote about History of Door Knockers (https://www.indianshelf.us/a-brief-history-of-door-knockers/). You can also add this link in your blog post so it will help your readers who are really interested in knowing the interesting facts about the Door Knockers .